Here at The App Store Chronicle, we try to make all of our emails helpful. Sadly, many major companies don’t share our values, and in return, people flee their email lists at the first opportunity. Who are the worst offenders? Who makes the worst, most annoying, or boring email newsletter? We’ve gone through the data to find the 25 worst email newsletters. Running may be an enjoyable activity, but it’s really not that interesting to read about. Nearly 40% (39.50%, to be exact) of Runner’s World readers opted out of their emails, when given the chance. Another subject that’s not too interesting: Plumbers, electricians, and contractors. 39.70% of Angie’s List subscribers fled, when given the chance. Social shopping is hot right now. Unfortunately, the newsletter from Polyvore, a social shopping startup, is not so hot. 40.40% of Polyvore’s shoppers chose to opt out of their email newsletter, when given the chance. There comes a point in many lives, when we need someone to take care of us. Usually, it falls upon our family members to find help, and find it fast. That’s where Care.com comes in. Unfortunately, the topic of long-term care is a bit too morbid for most normal people, so not-too-surprisingly, 40.60% of Care.com’s subscribers opted out of their newsletter, when given the chance. Schoolfeed is a great idea in theory. Communicate easily with your classmates, and stay informed. Unfortunately, in practice it can get a bit annoying, which is why 40.60% of subscribers chose to opt out of their email newsletter. Parties; By definition, they’re special occasions, which means that hearing about them on a daily basis can be a bit depressing. Perhaps that’s why 41.60% of Party City subscribers opted out, when given the chance. 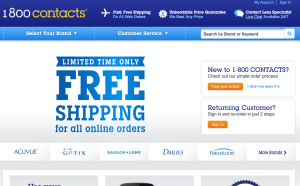 1800 contacts specializes in contact lenses, and contact lenses only. When I think contact lenses, generally I think of someone who habitually buys the same brand without a second thought year after year. 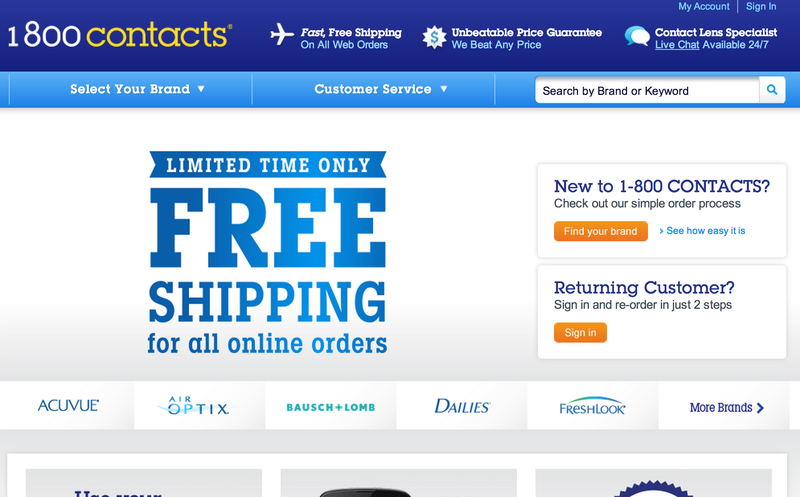 Perhaps that’s why 42% of 1800 Contacts’s subscribers said that they had no interest in receiving emails from the lens discounter. Active.com combines two things that we’ve already determined aren’t that interesting in emails: Fitness, and events. And it shows. Active.com sees an unsubscribe rate of 44.70%. Expedia is the lone travel website on the list, and they’re pretty high up the list, which makes analysis a bit hard. Perhaps hearing about your dream vacation, while sitting at home, is a bit of a tease, but my guess is simply that they send boring, complicated emails. That’s why 45% of their subscribers flee, when given the chance! Another in the list of things that nobody wants to hear about by email: Flowers. They’re for special occasions, and it’s the kind of product that you seek out, rather than buying it when you come across it. Very few people buy it frequently, so there’s no reason to hear about it frequently. 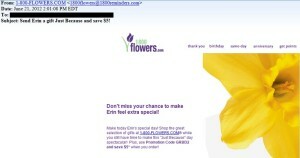 That’s why Pro Flowers, our 3rd-least-liked marketer, sees unsubscribe rates of 45.10%. As we pointed out in #6, there’s a right way and a wrong way to email about tickets. Ticketweb does it the wrong way, and in return, they see the crazy unsubscribe rate of 47.50%. Perhaps this example sheds some light on their unsubscribe rate. Apparently the person who received this email had just broken it off with “Erin”. This must have been uncomfortable. And, in our number one spot for the worst email newsletter/marketer we have…another flower shop. The second in the top three. Interestly enough, it’s also one of two “1800” companies in the top ten. This reinforces the lesson that very few people want to read about flowers (not surprising), but it also reinforces that companies with brands based on a phone number, should focus on that phone number(also not that surprising). 1800 Flowers loses 52.50% of their subscribers, when subscribers are given the chance to opt out! That’s crazy! Over half of their subscribers. They really need to work on their brand image, or at least make their emails less terrible. A Newsletter That Isn’t Bad! Sign up for our newsletter, and get weekly interviews, reviews, quizzes and more, for free.. Most of our thousands of subscribers stay for a reason! This unsubscribe data is from Unroll.me, a service that helps users easily unsubscribe from a variety of newsletters with ease. Unsubscribe rates using the familiar link at the bottom of the email is definitely much lower for each of these providers, because it’s more difficult, but nevertheless the methodology is accurate for determining the worst, or at least, the least-enjoyed email newsletters.